This week my world has taken on something of a feminist flavour. Not that I am not a feminist – I am. I didn’t actually plan it that way but when I look back there has been a definite theme to the events I attended, the things I learnt and the conversations I had. Might be the planets aligning, might be a raising of my feminist consciousness. Might be my current musings about what my future might look like. Who knows. But over the last four days there has been a lot for me to consider about the future of women. On Wednesday, I listened to some amazing women (and one man) explore women’s roles in our modern world at the Women in European Business Conference. It featured an excellent panel discussion, an interview with the always fabulous Joanna Lumley and a fascinating 45-minute presentation from Harvard associate professor and social psychologist, Amy Cuddy on shaping who you are – literally. It was an inspiring night and it was thanks to the ‘oh I’ve double-booked’ mistake of a work colleague that I got a guernsey. And what did I take away from all of this? That there are many, many choices about my future, many potential pathways to explore and a myriad of conversations to have. Oh and a potential place on the invitation list for next year’s event. On Thursday, I listened to a lively discussion on the Pinkification of Young Girls at Selfridges as part of The Beauty Project. This was the last in a series put on in partnership with Intelligence Squared who always offer controversial topics and provocative panelists and with the future of the world’s female population firmly in their sights, Alannah Weston, Tiffanie Darke, Tanya Gold and Katie Hopkins launched into a litany of opinions about the dangers (or not) of a rose coloured world and the potential of a ‘princess’ generation. It seemed to me that we came no closer to any answers and whilst it was an interesting discussion, it meandered around for a while then finished all too quickly. In the end, it did transpire that encouraging a questioning mind, a breadth of choice and a sense of confidence in our women of tomorrow were the keys – and also some of the prevailing themes from my previous evening’s WEB Conference. How on earth this is going to happen, I have no idea but that the topic continues to raise in profile is generally deemed a positive thing. But is it enough? On Friday morning I listened to a less-than-seven-minute TED talk from Dan Gilbert called The Psychology of your Future Self. (You may have noticed over the last few posts that I am having a bit of a love affair with TED talks at the moment.) Anyway, Gilbert postulates that we all under estimate how much we will change in the future and he uses some really clever ways of demonstrating that our heads really are buried in the sand when it comes to envisioning our future selves. Think about who you were, what you were doing and what was important to you ten years ago. Then think about how much you think you’ll change in the next ten years. Doesn’t it stand to reason that the rate of change will continue? Well, apparently reason has nothing to do with it but given my recent reflections about what might lie before me in the next 40 or so years, it seemed another fitting piece to add to my puzzle. 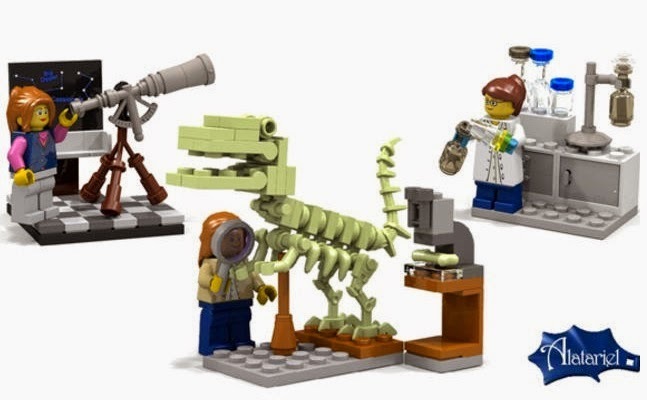 And finally yesterday, when I opened this week’s Mental Floss newsletter, I discovered that LEGO will release a new series featuring female scientist figurines this coming August. Hurrah! (Imagine hooray in the posh, clipped syllables of the English.) The LEGO Research Institute set will show women exploring the world from three different angles – chemistry, paleantology and astronomy. And not a skerrick of pinkification to be seen. Double hurrah! So while the rate of change might seem snail-paced to those of us who are firm believers in gender equality, it appears that all it takes are the words of a seven-year-old to create a little momentum. At this rate, just imagine where she could be in ten years time. So as I sit here on the comfy couch, tap-tap-tapping away and reflecting on the week that was, I am definitely left with some positive feelings about the whole feminist issue. But it still seems like we still have one hell of a mountain to climb and while I lean towards the side of a bright future ahead, I think that the visibility remains poor and the path ahead uncertain. Not only for the women of future generations but also for those of us struggling with how to create a world of choice and equality now. And it leaves me wondering just who and where I might be in all of this in ten years time. Bears some thinking about doesn’t it? Scientists don’t know what makes up 90% of the Universe! Might just stay at home….